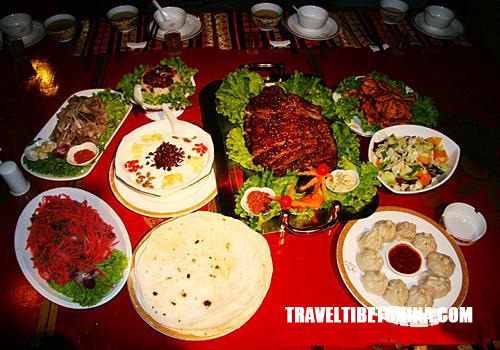 Traditional Tibetan food consist mainly barley, meat and dairy products. Vegetables are scarce in the high altitude. Tsampa is the staple food of Tibetan people, which is consumed daily. It is actually barley flour made from parched barley, unhusked and ground into fine flour. Put some flour with salted butter tea in a bowl, rotate the bowl with the left hand and mix the food with your fingers of your right hand, roll it into small lumps, then squeeze it into your mouth with your fingers. Other ingredients may also be added to add flavor. 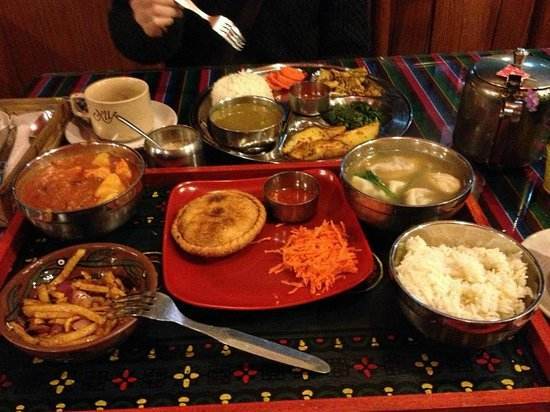 Tibetan people eat Tsampa at every meal and bring it as instant food in travel. The salted butter tea is an indispensable Tsampa pal. Boiled tea is poured into a long cylindrical churn along with salt and yak butter. Vigorous churning makes the ingredients well blended and ready to serve. The local people drink it throughout the whole day. Yak butter is very important local food and it is separated from yak milk by hard churning. After butter is separated from milk, the residue becomes sour and can be made into milk curd which is a nice thirst quenchable and can be made into milk curd pastry with barley flour. Yoghurt is important daily dairy for Tibetan people. The creamy milk produced by yak cow is superb. The nomads in the eastern Tibet manufacture their yoghurt in a special process. The milk is boiled first, after removed from stove, some old yogurt is added in. Yogurt will form in a few hours. Yogurt has been a Tibetan food for more than 1,000 years. Dried beef and mutton stripe is also popular local snack. In the winter, beef and mutton are cut into long stripes and hung in shaded place to be air-dried. The dried meat is crisp and tastes good and can be eaten raw since the chilliness in the winter has killed bacteria during the process. Big joints of beef and mutton boiled with salt, ginger and spices are also popular dishes. They take the meat in hands and cut them with their knives. The guests will be treated with breasts and spareribs. If you are treated with a tail of white sheep, it means that you are deemed as their guest of honor. Blood sausage, meat sausage, flour sausage and liver sausage are also favored by many local people. Other dishes include Momo (Tibetan dumplings), Thenthuk (Tibetan noodles) and yak tongue. Now in some towns, Lhasa for example, Tibetan food is supplemented by Chinese food, mostly Sichuan cuisine. Vegetables and fish become available in market. However, the locals seldom eat fish due to their religion and custom. Restaurants serving Tibetan food, Chinese food and even western food mushroom in the streets to accommodate visitors. Lhasa Hotel (former Holiday Inn)'s restaurant provides Chinese dishes, Indian dishes, Nepalese dishes and western dishes. Kailash, Tashi, Snowlands, Dunya (former Crazy Yak) and Makye Ame are popular among visitors also in Lhasa. Veggies may still have little choice in short seasons however.